One of the best things about the ReaderLinks Reader Teams tool is that you have a central location where your readers can submit issues to you. No more having to field them from emails and Google sheets and direct messages. 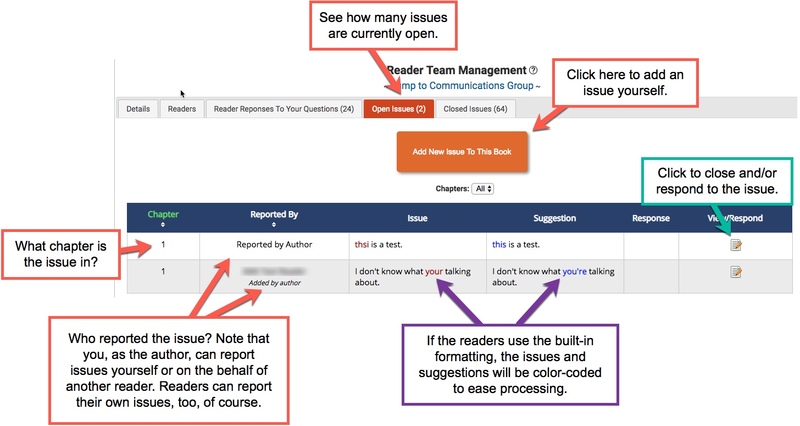 Instead, insist that all issues be reported through the Reader Team tool. This will allow you to keep track of all issue reports in one convenient location. You’ll also be able to add issues that you find yourself, or add them for one of your readers in the event that the reader is unable to join the team for some reason. The issues main page breaks down by chapters as well, making it so you can focus specifically on one chapter at a time as opposed to seeing all 50 chapters at once. 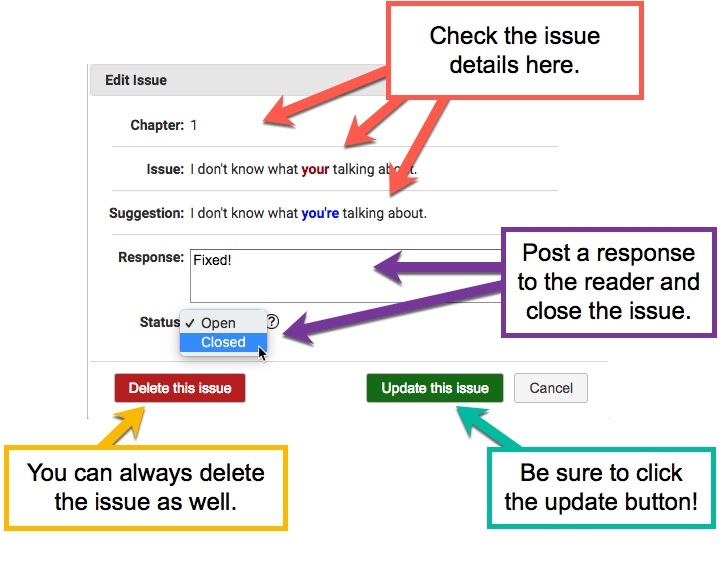 Additionally, if your readers follow the rules of issue reporting properly, the issues and suggested fixes will be color-coded to help you along when fixing reports. Adding issues, either by your or your readers, is effectively the same. The one difference is that you have the option to submit an issue as yourself or as another reader. Step 1: Select the chapter the issue is in. 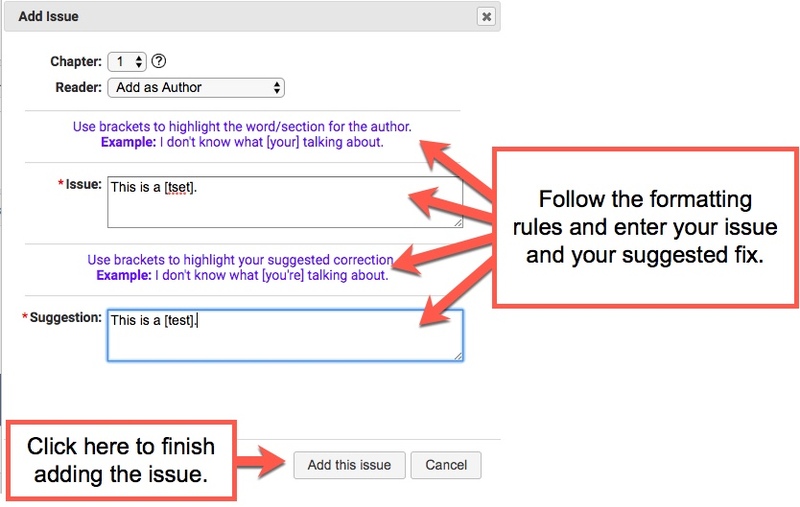 Step 2: Add the issue as yourself or as another reader. Note that readers will not have this option on their view. 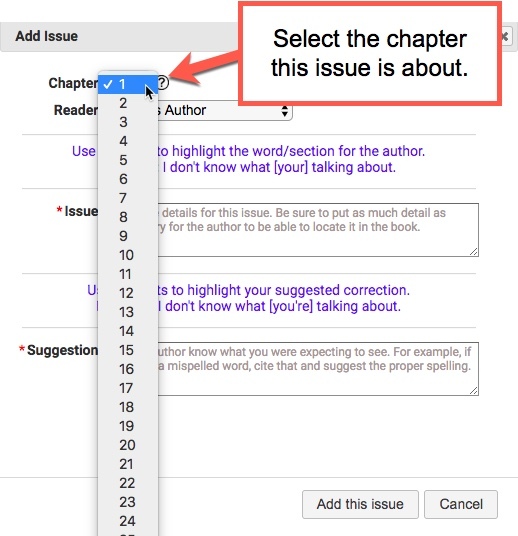 Step 3: Pay careful attention to the purple text so that you can use proper issue formatting. This will make it easier on you when you go back to fix issues. Encourage your readers to pay attention to this formatting convention as well. 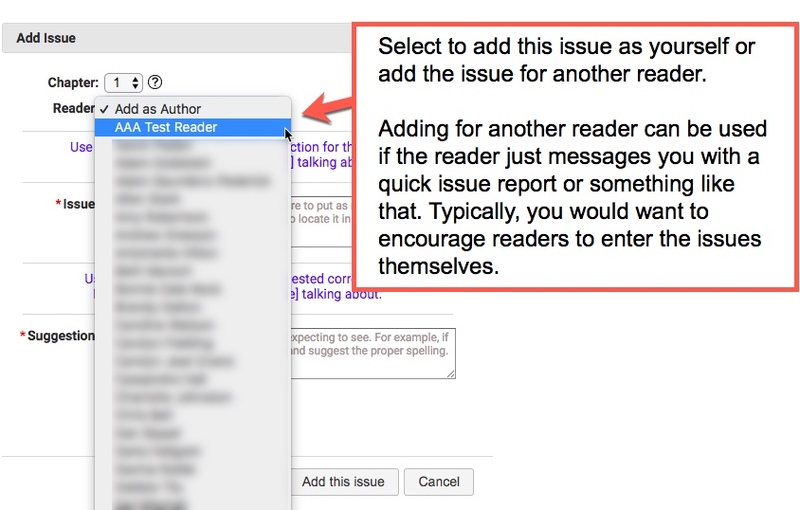 Note also that the idea is to have the reader report an issue and a suggested fix for that issue. Once a reader has reported an issue, you can open it and see what was reported, post your response, and set the status of the issue. It’s always a good idea to close completed issues so that you don’t redo work. The closed issue tab is identical to the open issues tab except that it just shows closed issues only, and you can’t create a new issue from the closed issues tab. All open issues are filtered out, just as all closed issues are filtered out of the open issues tab.